Many commercial buildings eliminate the roof as a visual element. Their flat or low-slope roofs function as necessary, but are considered so ugly they must be concealed from view behind parapets. A pitched tile roof, by contrast, can contribute to the architectural statement while meeting the highest performance standards. More than simply shedding the sun, wind, rain, and snow, it also catches the eye. Concrete tile roofs are energy-efficient, durable, and long-lasting, while presenting a designable surface that can be the building’s crowning touch. The design and composition of a roof determines not only its appearance and achievement of basic roof functions, but also how it plays its starring role in the energy performance of the building as a whole. The roof is the exterior surface that gains the most heat, directly exposed to solar radiation. It is also the ultimate barrier moderating the loss of rising interior heat. While reflectivity on top and insulation underneath are generally considered the main ingredients of a roof’s energy performance, tile roofs possess features in its shape and structure that increase performance in ways other types of roofs cannot. Banff, a town located within a national park, has an unusual structure of civic authority, with multiple levels of governing bodies that present unique challenges to new building projects. New commercial projects, for example, are required to enhance the surrounding views of Alberta’s Rockies. The new 174-room Moose Hotel does just that by giving nature a beautiful frame in the form of a distinctive concrete tile roof. The three-storey complex is one of the largest developments built in the town since the 1998 enactment of the Commercial Growth Cap. Due to Banff’s strict growth limits and unusual way of allocating development permits (which includes a lottery), it was 15 years before the final property size and shape was acquired and approved. The design that finally won approval, by Calgary-based architect Ted Darch, principal of E.J. Darch Architect LLP, resembles a village with a central courtyard. The numerous conjoined buildings are connected to each other by interior corridors on the lowest level and exterior walkways on the two upper floors. Virtually all the upper-storey rooms and walkways have scenic views. Figure 1: Solar Reflectance Index (SRI) is used to qualify roofing materials as ‘cool roofs’ under many sustainability certification systems, including Leadership in Energy and Environmental Design (LEED v4) standards shown here. The exteriors of the buildings are clad in thick natural stone masonry veneer and make extensive use of exposed cedar wood panels and trim, which the architect terms “traditional materials” for mountain locations. The building complex is crowned with a series of bright red concrete tile roofs. The façade presents a series of dormers, some with raised sections, and additional canopies over the porches—a profusion of roof surfaces at varying angles. All these individual roofs “give it a fine texture,” as Darch describes. “It’s also nice to have some protections over the entry doors to the suites,” he says, adding the biggest challenge of the roof design was calculating the effects of water drainage and snow-slide. The slate-style concrete tiles in Mission Red set off and complement the majestic surrounding mountain peaks. 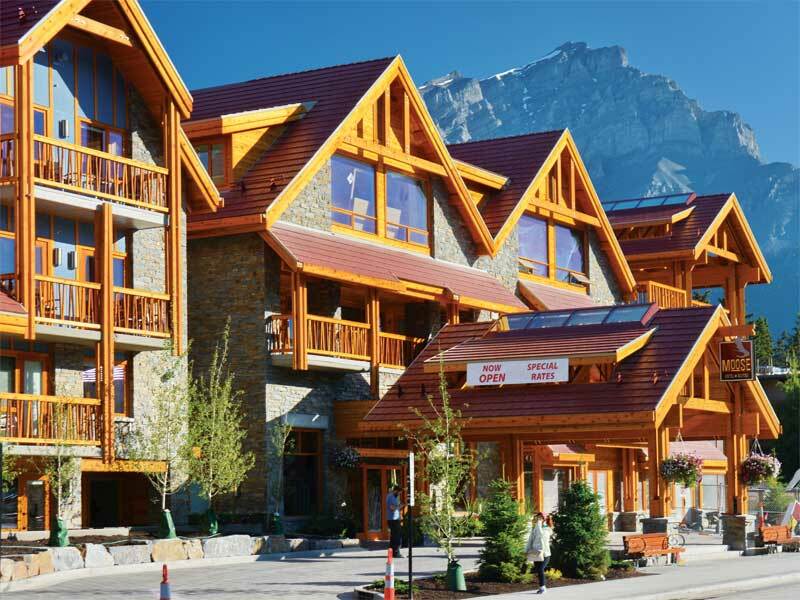 Red roofs are also traditional in Banff, going back to small buildings in Banff Park built in the 1920s, with often painted metal or painted cedar shingles. However, the selection of the tile roof was based not only on appearance, but also on several performance factors.